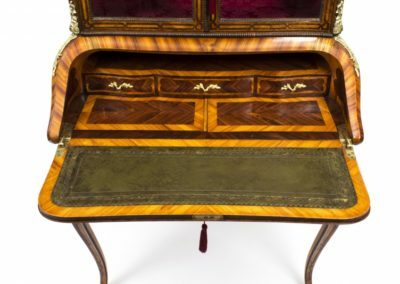 We are very pleased to be able to offer this rare Antique French kingwood and marquetry inlaid Bonheur du Jour, or Ladies Writing Desk, for sale. 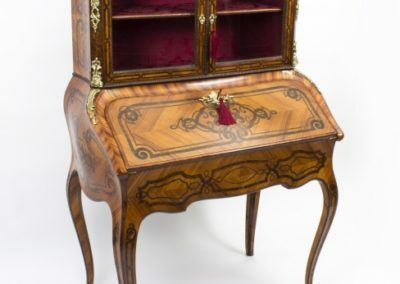 Our experts have dated it to around 1850 and have assessed it as being in truly excellent condition, as you can see from the photographs supplied. 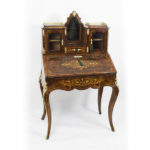 The desk is offered for sale at just £4250. 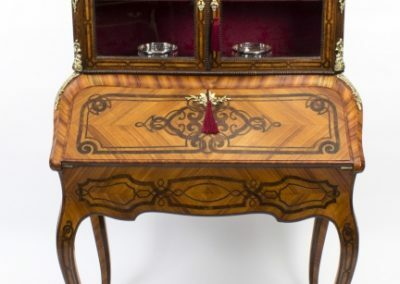 The desk features cut brass and purpleheart inlays and features lovely ormolu mounts making it a superb example of quality design. 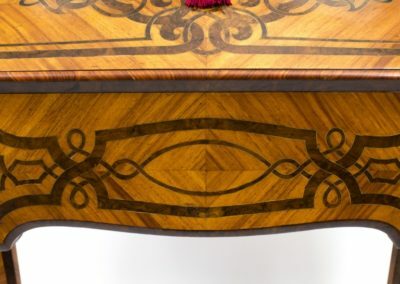 This really is a very fine example of just how good kingwood can look and the inlay work is clearly that of an accomplished craftsman. 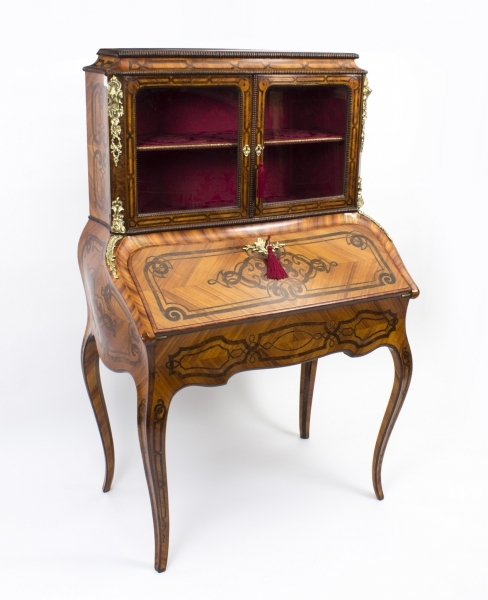 The bonheur du jour features a pair of glazed doors at the top which open to give access to a shelf. 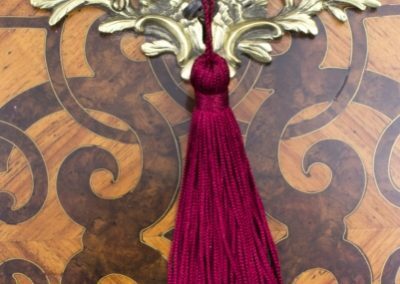 The interior has been relined using a sumptuous burgundy damask. 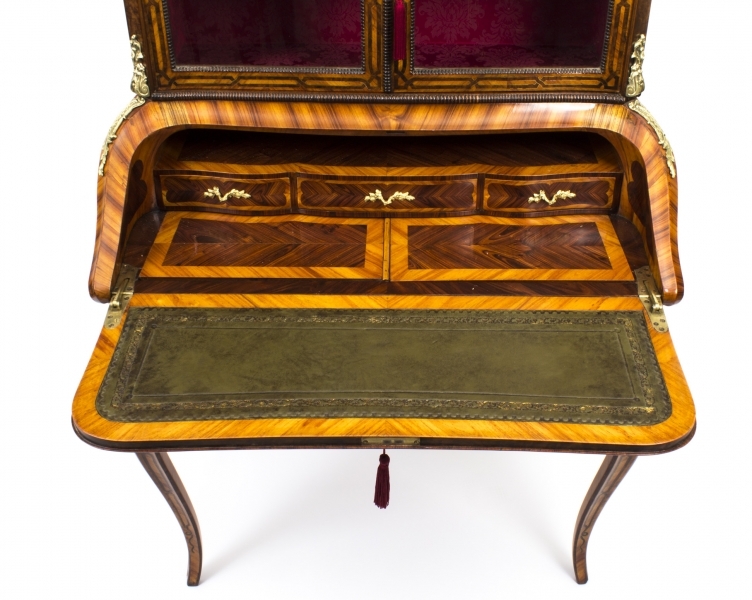 There is a bombe’ shaped fall which opens to reveal an inset green leather writing surface which features a gold tooled, embossed edge detail. 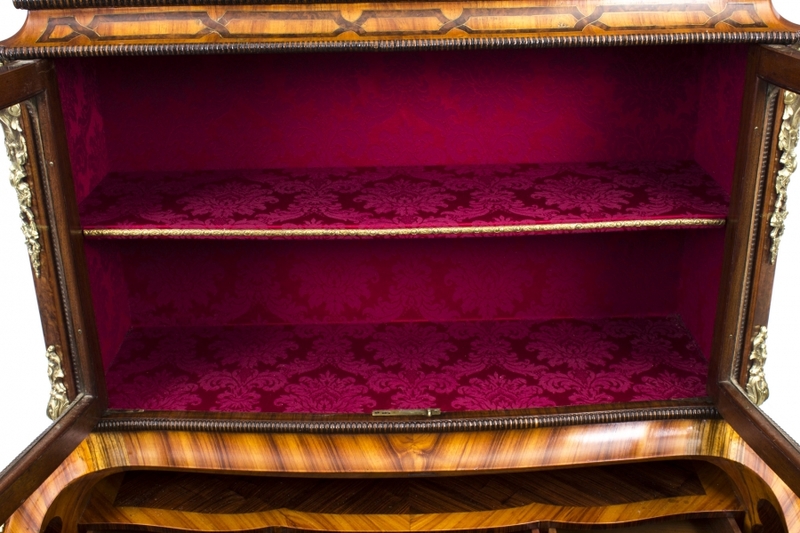 Also revealed are the three spacious drawers which provide useful storage for your stationery and other items. Behind the fall you will find two hidden slides that provide access to the well. 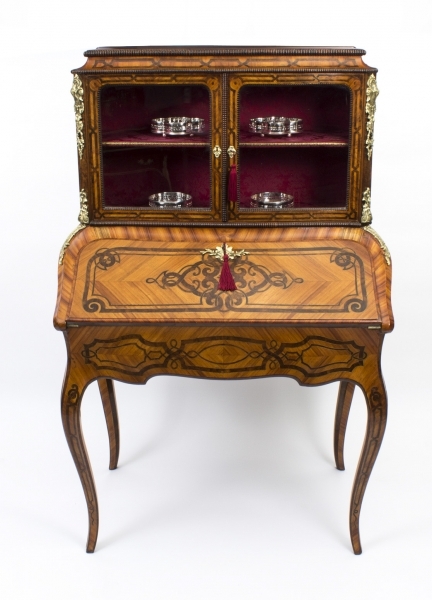 The table is mounted on elegant, swept cabriole legs and is supplied with its original locks and keys. 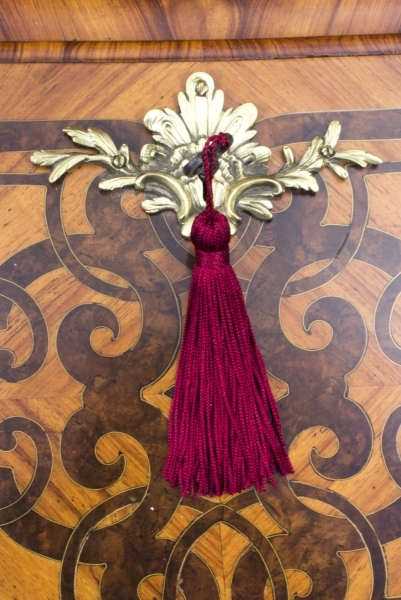 All of the decorative escutcheons are original as are all the ormolu mounts. 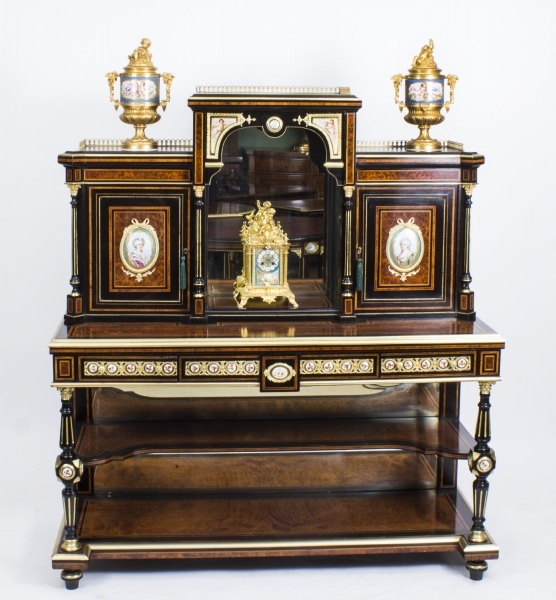 These items have all been skillfully cast and gilded are are all in very good, original condition as can be seen from the photographs. 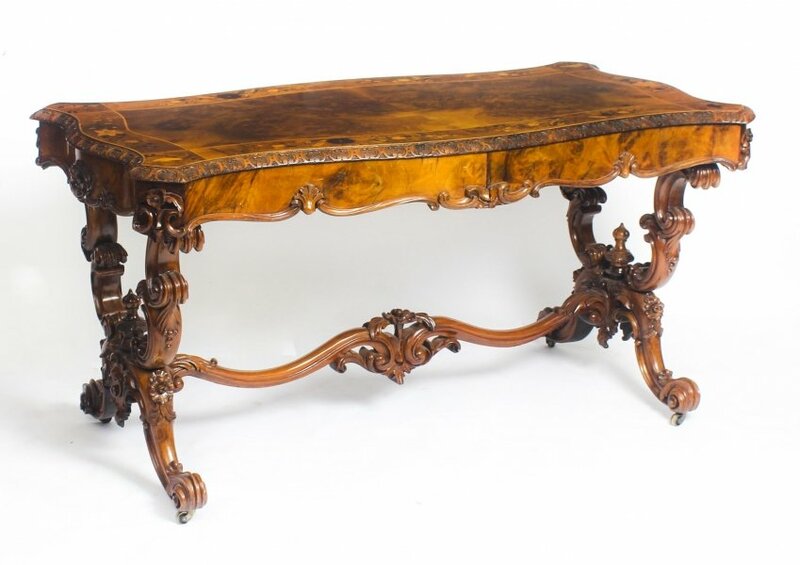 This lovely antique writing table measures 138cm in height x 88cm wide and 55cm deep. 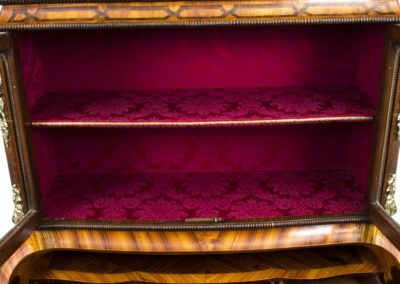 The equivalent in feet and inches is: 4 ft, 6 in x 2 ft, 11 in x 1 ft, 10 in. 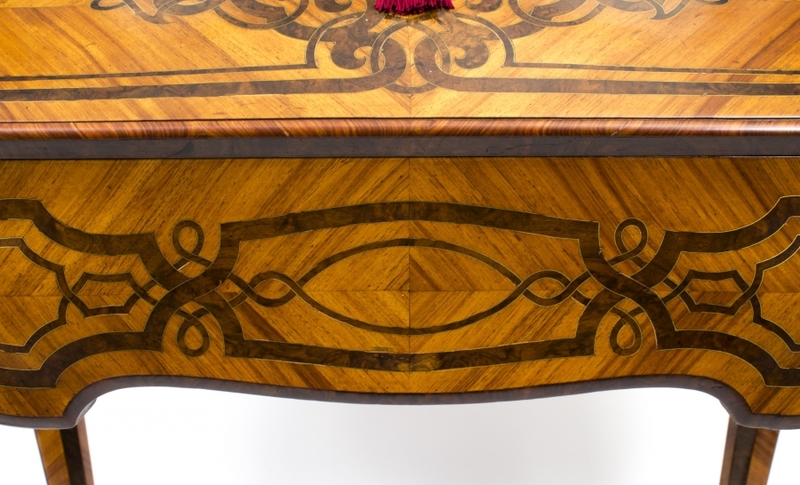 We can carefully pack and ship this Bonheur du Jour to any worldwide destination. We request that you contact us for a shipping quotation before making a purchase. Shipping to mainland UK destinations is free of charge. 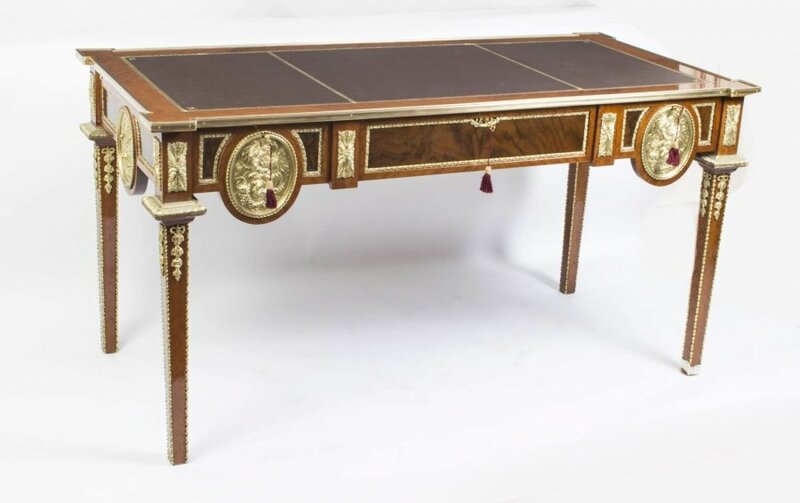 Should you wish to discuss any aspect of this delightful writing table with our team of experts please contact us by telephone or email and quote the reference number 07451.